We were delighted to be returning to Santa’s Spectacular at Willow’s Activity Farm again this year (as we loved Santa’s Spectacular at Willow’s Activity Farm in 2017). Our three daughters, now aged 8, 6 and 3, were all equally excited, but for different reasons. NB: Lucy and her family received complimentary tickets to Santa’s Spectacular at Willows Activity Farm, but their opinions are their own. Naturally they were all excited to be meeting Santa, but also for making a ‘cuddle’, which this year was a teddy bear. Our eldest was also excited about the large soft play, and the younger two were looking forward to seeing the animals and the friendly elves. We rate Willows Activity Farm amongst the best places to see Santa in London but, it can also be very busy. Last year we arrived mid morning and took the advice of Santas Elves and waited until late in the day to meet Santa. However this year we took a different approach and set off from home early (by our standards!) and arrived at Willows Farm shortly after it opened at 10am. 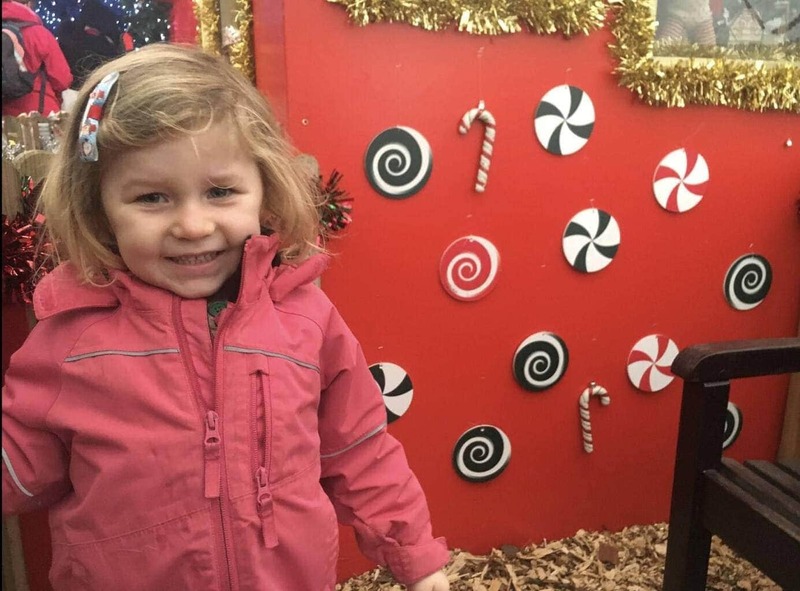 You can read our Top Tips for visiting Willow’s Farm at Christmas here! We made a dash towards Santas Grotto but already at 10:20 the queue was building up. 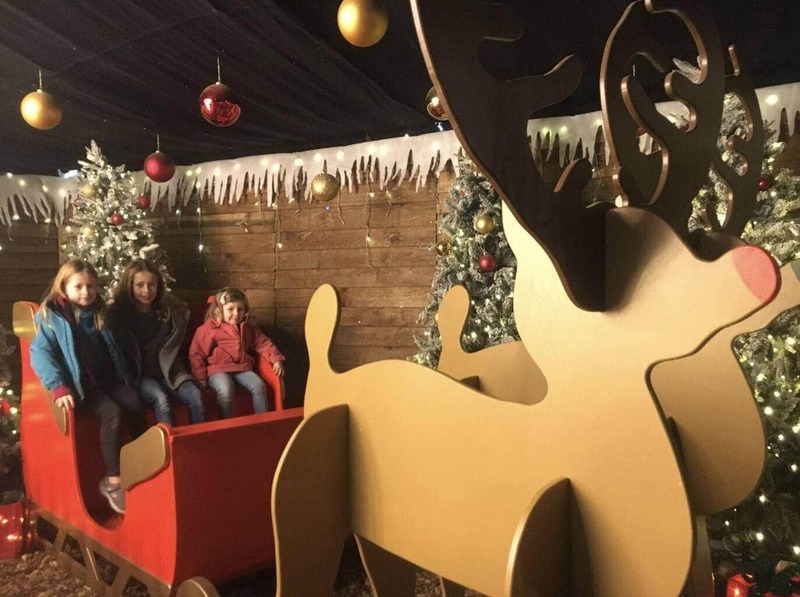 As we know how much Willows Activity Farm has to offer, my husband took the children off to make their cuddles whilst I stuck with the grotto queue (whilst enjoying the chocolates being handed out by a passing elf… don’t tell the children!). They returned 20 minutes later clutching their newly created teddy bears safe stored away from the mud in gift boxes. There was a few more minutes for the girls to enjoy the fairground rides, before the queue moved into the grotto building and they came to join me. As I glanced over my shoulder I realised I was right to stay in the queue as it had now doubled in length. Once inside, the queue passed surprisingly quickly. The line weaved in and out of beautiful Christmas displays which the children and I admired. We passed a little cafe selling refreshments, would a coffee be needed. 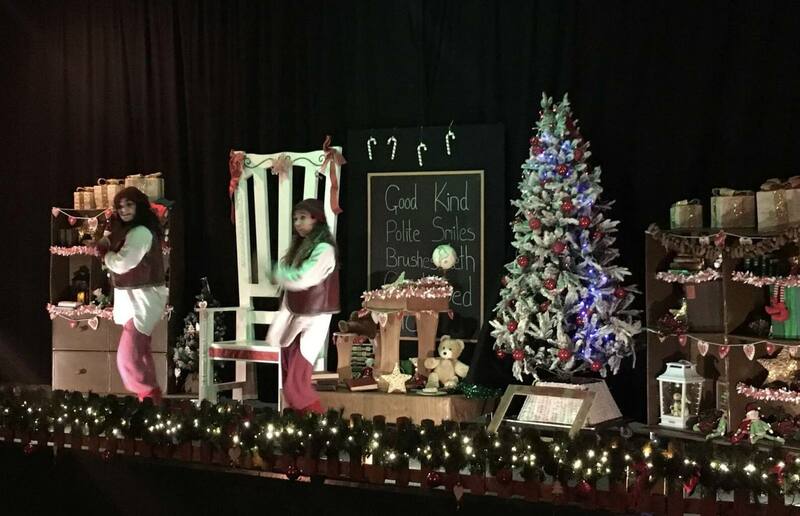 The children were able to climb aboard a giant sleigh and sit amongst sparkling decorations. There are so many opportunities for a fabulous Christmas family photo. We queued for an hour in total before we met Santa, but not once did any of the children get restless or upset. Meeting Santa at Willows Activity Farm was every bit as lovely as I remember. A friendly elf escorted us to Santa’s warm and cosy room, which was as beautifully decked out as the displays we had seen in the queue. Santa presented the children with a key to the toy store where they could choose any present they liked. We were not able to take our own photos, but our friendly elf took a photo of all of us, which now adorns the children’s school bags in the form of a key ring (which cost around £5 each). After the excitement of seeing Santa we headed out into one of the Willows Activity Farm barns to decorate gingerbread men and eat our packed lunches, which we brought with us this year after spending too long in the cafe queue last year. However, this year I think the queues looked much shorter. After the children had decorated (and devoured) their gingerbread men, we headed out to watch a 3D sleigh movie. Sadly we missed the nativity play starring real animals this year, but I would highly recommend this if you haven’t been before. This year we chose to go to the Elf Sing-a-Long instead, which helped us all get into the Christmas spirit. We whizzed around hunting for reindeer between activities; if you can find all of them, you are rewarded with some sparkly reindeer food to leave out n the garden on Christmas Eve. Inevitably, our day ended in the enormous soft play, which all three children loved. Our eldest also snuck upstairs to fire snowballs from enormous cannons, with some equally hot and excited children. It was another wonderful visit to Santa’s Spectacular at Willows Activity Farm and the perfect start to our family Christmas season!